Coconut Oil is still having a moment! From Dandruff to weight loss it’s being hailed as the miracle cure – A quick search on Pinterest of ‘Coconut Oil’ and the suggestion list explodes!- Acne, Weight Loss, Lashes, teeth whitening, oil pulling, for dogs, deodorant, detox, moisturiser, and it goes on and on! Can it be true?! Coconut Oil just, like it sounds is the oil taken from the flesh of the coconut. It is now widely available in a handy jar that you can take home and virtually use anywhere and everywhere. Like most things, there are different grades of Coconut Oil that vary in cost – Raw and unrefined Coconut Oil is generally the most expensive but the best like anything there are cheaper versions that are just not the same quality. 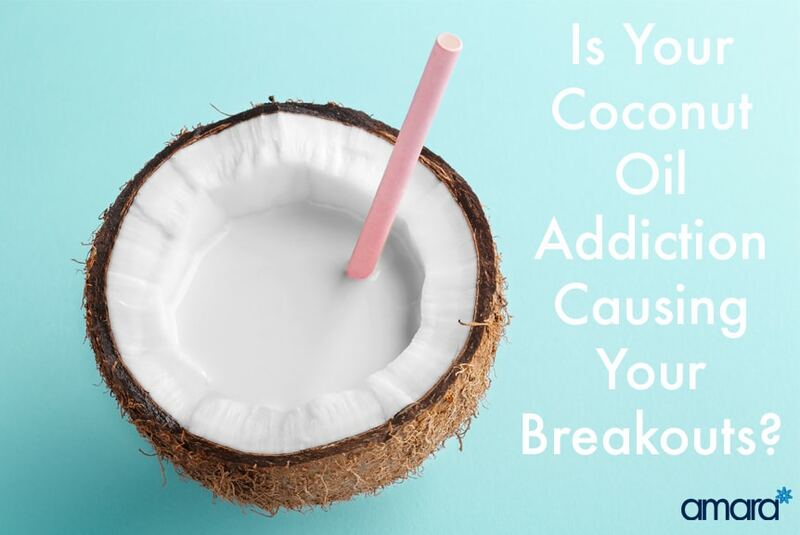 The Coconut Oil cult is sworn by it from everything to weight loss to Acne, however, could it actually be causing breakouts? No! You’ll cry! Coconut oil is natural and couldn’t do any harm. We all have different Skin types and react to things very differently. Many people use Coconut Oil all over their body including their face and are discovering that they are developing breakouts of Acne. How can Coconut Oil cause Acne? Acne is caused a buildup of oil on the skin which clogs the pore which then causes the spot to appear. Coconut oil is a saturated fat although it is moisturising (and actually has a light SPF!) continuous use will build upon the skin clogging the pores and causing the spots to appear. Many users of Coconut Oil use it on their face and claim that it has never caused a breakout, however, we all have different skin types and react differently to all ingredients natural or not. There is no proof that Coconut oil cures or prevents Acne – in fact, it all points to the opposite. Though Coconut Oil is antibacterial there is no evidence that it would penetrate the skin deep enough. If you are already and Acne sufferer (like myself) then it’s best to stay away from anything that could potentially clog your pores further. Acne sufferers likely already have clogged pores so it’s best to avoid using anything potentially clogging. When it comes to Acne, Salicylic Acid is still the go-to miracle ingredient. (I use the term miracle lightly as it so often used with fads.) There are so many products that claim to have Salicylic Acid, however, Cosmetic products do not contain enough to actually have an effect. Non-cosmetic Acne treatments such as ZO Skin Health are available with a consultation with a Skin Health Specialist only. Your Skin Health specialist will review your skin and put you on a plan that works with your skin and also look at the underlying cause of your Acne. The ZO Skin Health and the ZO Medical range has a variety of Acne Treatments such as Cebatrol Pads, Aknetrol and AkneBright and even a new Salicylic Acid Concealer! When it comes to Acne there is no such thing as a quick fix anything with immediate effects could be potentially damaging your skin and causing scarring. See a Skin Health Specialist to get a realistic treatment schedule that will rid you of your Acne! Book in now to get started on your Skin Health Journey.